When an Irish creamery sends you a ton of free cheese and butter in late February/early March, it is their way of telling you, use their product to create a St. Patrick’s Day grilled cheese. It is a no-brainer in my opinion and that is exactly what I did. 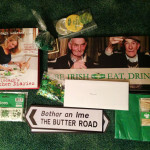 A couple weeks ago, as evidenced by the photo below, Kerrygold not only sent me 7 different varieties of cheese, they also included 4 different varieties of butter. I had planned to make a non-holiday related grilled cheese so many different times but life simply got in the way. As the days passed, I realized we were so close to St. Patrick’s Day that I needed to make a holiday grilled cheese, just as I did last year. 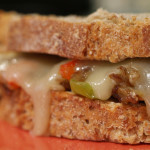 I needed to improve upon last year’s St. Patrick’s Day Irish Soda Bread Grilled Cheese and make something special. I succeeded beyond my wildest dreams and who would have guessed that kale would be included? Kerrygold Skellig is for the real cheese lover; it delivers exceptional flavor – rich and tangy, with a hint of sweetness. This cheese is crumbly, savory and has a lovely, butterscotch-like sweetness. Skellig is ideal for cooking, making cheese sauces or taking center stage on a glorious cheeseboard. 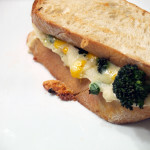 For this grilled cheese, I decided to use a Kerrygold cheese that I hadn’t yet tried. Since there was going to be a bit of tang in the grilled cheese with the garlic and sauerkraut, at the advice of the sous chef, I went with the Skellig, a sweeter cheddar. This cheese is phenomenal. It has the creaminess of a Havarti and the bite of an aged Cheddar combining to make a very interesting and unique flavor profile. When I first sampled the Skellig, I really wasn’t sure what to think of it, but as I took another bite, I knew this cheese was unique and bursting with so much flavor. My love for this cheese only confirms my continued love affair with all things Cheddar (and Kerrygold). For every grilled cheese sandwich I create, I use Land O’Lakes “Sweet” Butter, no questions asked. (It is what my grandmother and mother have always used.) However, for this grilled cheese, since I received free butter and it is an Irish grilled cheese, I thought I would use Kerrygold’s Garlic & Herb Butter. No doubt about it, this is some of the best butter I have tasted. The flavors are complex and apparent without being overpowering. 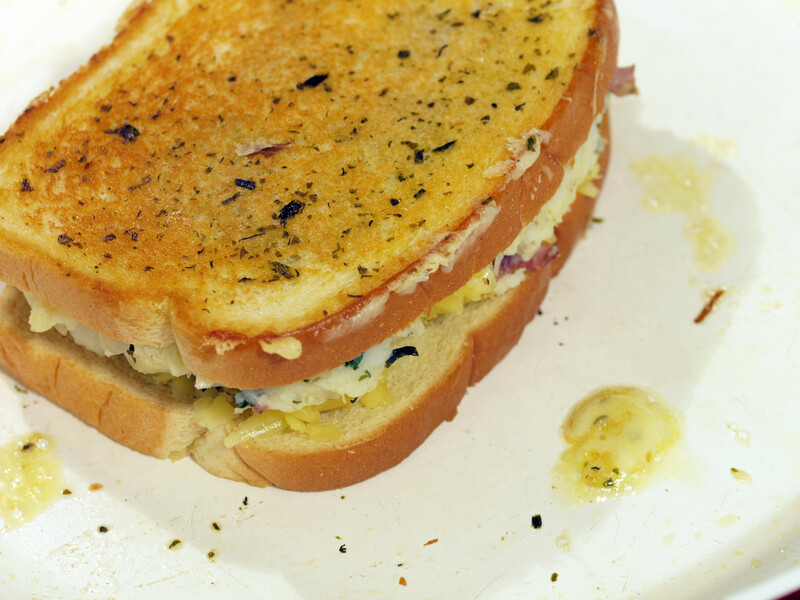 The Garlic & Herb butter provided both a great flavor to the ingredients of the grilled cheese but also the bread. When it comes to St. Patrick’s Day, the Irish, and trying to make a grilled cheese, the options always seem to come back to potatoes. I used potatoes last year and as much as I wanted to avoid them this year, I simply couldn’t. Everything I researched online included potatoes and even the St. Patrick’s Day display at my local grocery store had potatoes. I couldn’t avoid potatoes. 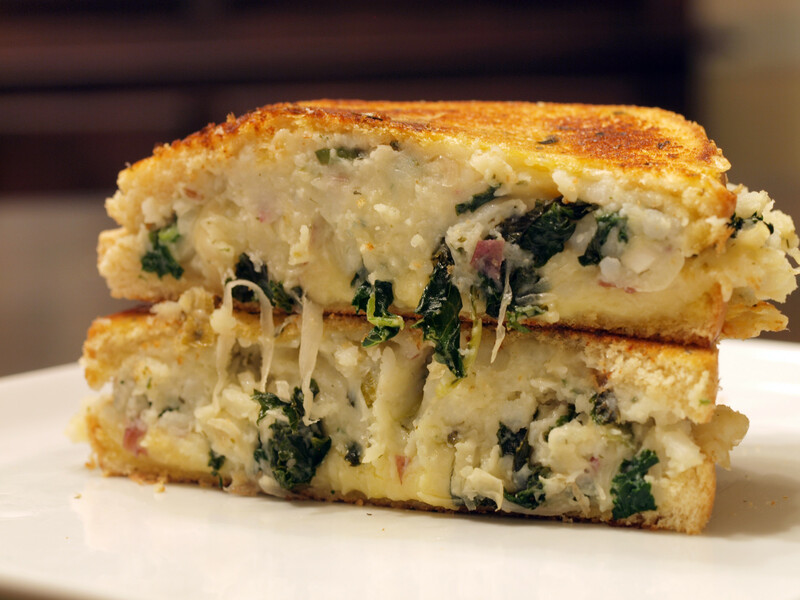 The typical Irish dish that I based this grilled cheese off of is Colcannon, which features potatoes, kale or cabbage, scallions and milk. I obviously didn’t follow the recipe exactly, but it was most definitely my inspiration for this grilled cheese. Colcannon is traditionally made with either kale or cabbage, both great ingredients. Since I used cabbage last year, and wanted to use sauerkraut this year, I decided on kale. Kale is most definitely the ingredient/vegetable of the day, with it being everywhere and sold as everything from raw to chips. I know many people are in kale overload, but as someone who only eats it randomly and has ignored the kale fad, I thoroughly enjoy the unique flavor that it provides. Yes, I know sauerkraut is not a traditional ingredient in Colcannon but it is made out of cabbage, which is. 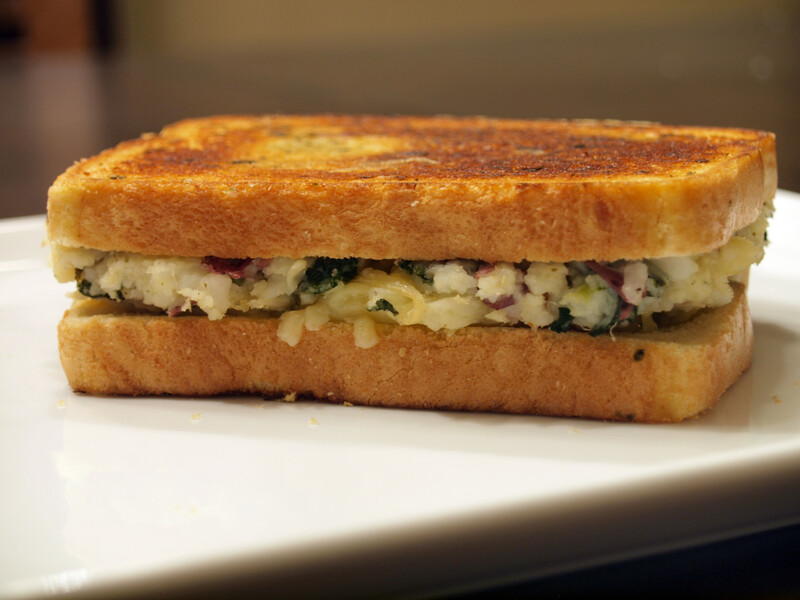 Plus, sauerkraut is a staple in another Irish dish, the Reuben, and one that I thought would add a bit of an unexpected flavor/bite to this grilled cheese. I don’t use sauerkraut nearly as much as I should since I always enjoy it. For last year’s St. Patrick’s Day grilled cheese, I wasn’t sure what bread to use so I went with Irish Soda Bread. Although the bread itself was good, it was a little dense for a grilled cheese sandwich. This year, I wanted to go a different route. I went searching all over for bakery fresh potato bread but struck out everywhere I looked. Fortunately, I found the last package of still fresh, but not bakery fresh, Schwebel’s Country Potato Bread at my local market. Since it was the last package, it seemed like it was meant to be. Plus, it turned out to be pretty delicious and the perfect vessel for a St. Patrick’s day grilled cheese sandwich. Now that you know all of the ingredients and their significance, it is time to learn how to put it together. 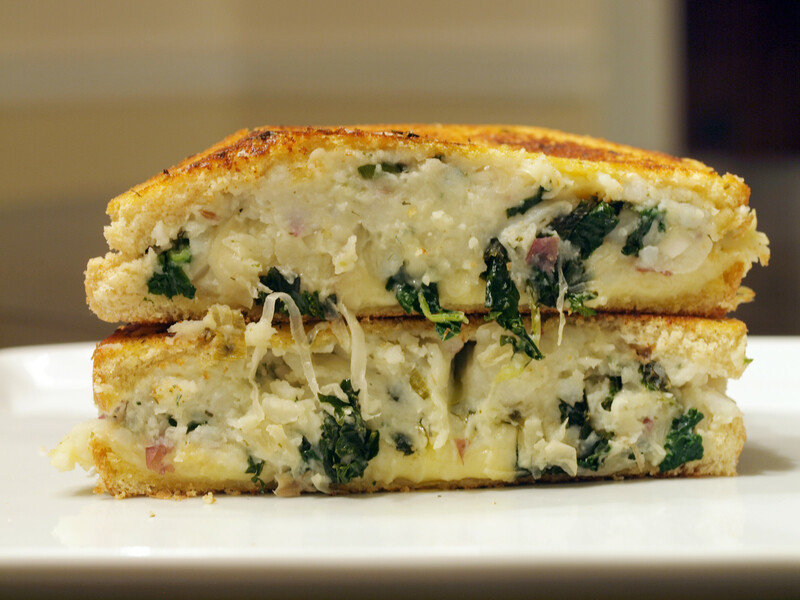 As I mentioned, Colcannon is the inspiration for this dish, providing a great canvas to create an amazing and most definitely delicious grilled cheese sandwich. Colcannon is traditionally made from mashed potatoes and kale (or cabbage), with milk (or cream), butter, salt and pepper added. It can contain other ingredients such as scallions, leeks, onions and chives. There are many regional variations of this dish. It is often eaten with boiled ham or Irish bacon. At one time it was a cheap, year-round staple food, though nowadays it is usually eaten in autumn/winter, when kale comes into season. To start, sauté the kale, green onions, sauerkraut and fresh garlic in Kerrygold’s Garlic & Herb Butter. Since I wasn’t sure how much kale mixture I needed, I continually added ingredients as I was cooking. When adding the kale mixture to the potatoes (I will get to that in a minute), I tasted/smelled them and realized I needed more goodies forcing me to sauté more. Depending on how much flavor and punch you want, of course depends on how much mixture you need to cook. I ended up using 3 cloves of garlic, 1 stalk of green onion, about 1/2 – 2/3 of a small can of sauerkraut and 3 leaves of kale in total. Please play around with the flavors and see what works for you. You are the one eating the grilled cheese, not me. 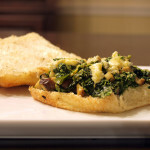 You will want to sauté the kale mixture slow and steady and let the kale cook down and flavors meld together. Give it time, pay attention, and you will know when it is done. Normally, mashed potatoes are just that, mashed. However, with these red potatoes and this grilled cheese, I wanted to make smashed potatoes with skins left on. Simply take a fork, as the sous chef did, and smash the potatoes until they are at a texture that you prefer. I went for somewhere in the middle. After that, add some milk to increase the creaminess and some salt to add some punch. Taste as you go along and you will be set. However, don’t over salt as you still have to add the mixture. 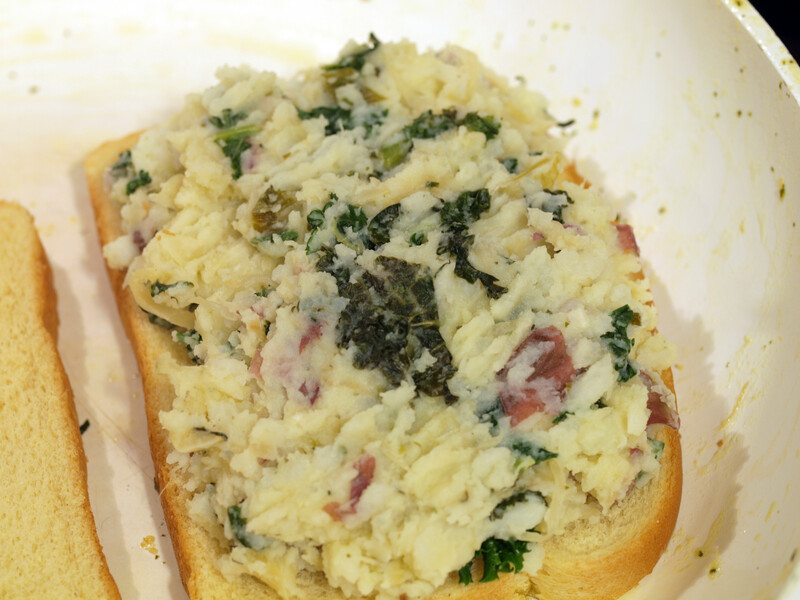 Simply take the sautéed kale mixture and add it to the smashed potatoes, folding it in with a fork. It really is as simple as that. I melted some extra garlic & herb butter to add to the entire mixture, enhancing the overall flavor. 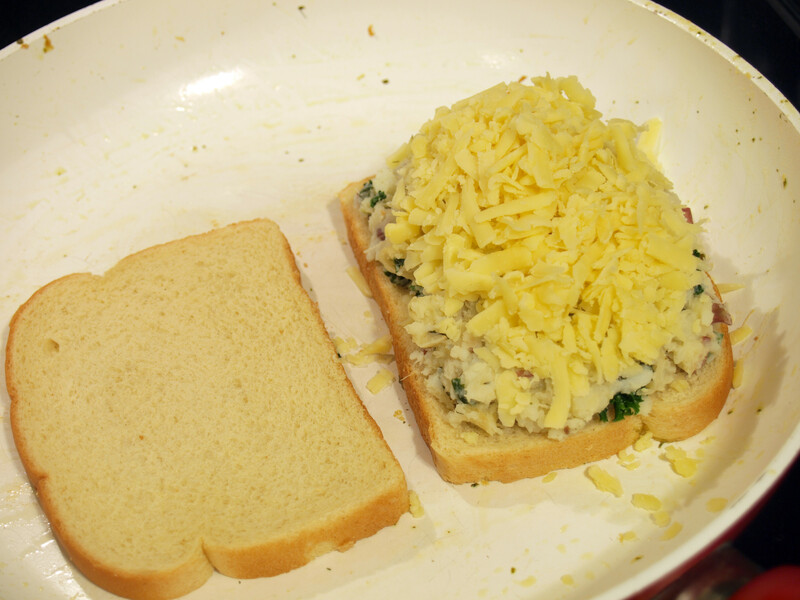 Once you have the kale and potato mixture all set, it is time to make the grilled cheese. Do not clean the pan after sautéeing the mixture/melting the butter. 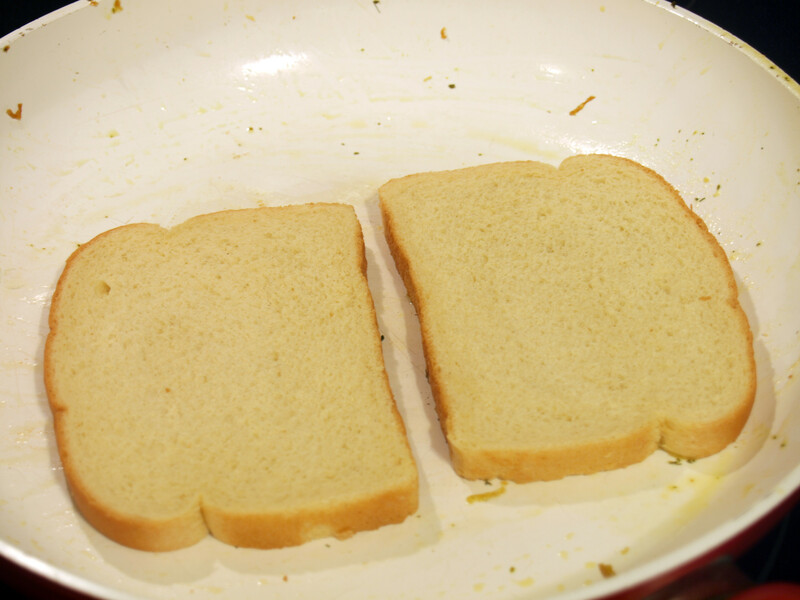 Use that sauté pan to cook the grilled cheese. 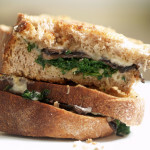 For this grilled cheese, use Kerrygold’s Garlic & Herb Butter on the bread. It adds so much. This year’s St. Patrick’s Day grilled cheese surpassed last year’s, the Irish Soda Bread Grilled Cheese, by a mile and may actually be one of the best grilled cheese sandwiches I have ever created. 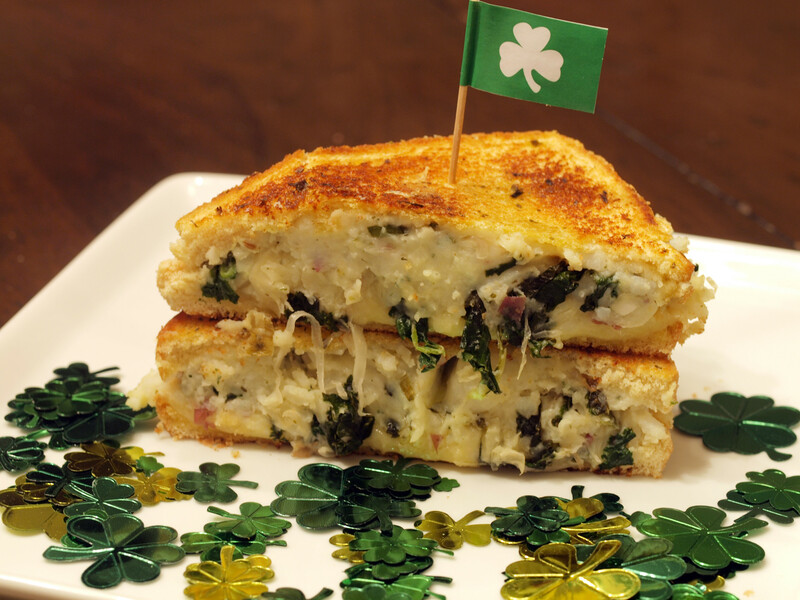 Basing this St. Patrick’s Day grilled cheese off of the Irish dish, Colcannon, and including fresh kale, allowed for a great start to this grilled cheese. With the ingredients included, Cheddar, garlic, green onions, sauerkraut and garlic & herb butter, you would think this grilled cheese would be extremely pungent but you would be wrong. This grilled cheese had a smooth, creamy texture with a more subtle but delicious flavor that combined to make an amazing grilled cheese. The bread, coated with Kerrygold’s butter, was cooked perfectly and provided an extra jolt of flavor that made this grilled cheese so very special. Sometimes with grilled cheeses that I create, an ingredient ends up not being necessary or is overpowered by other flavors in the sandwich. 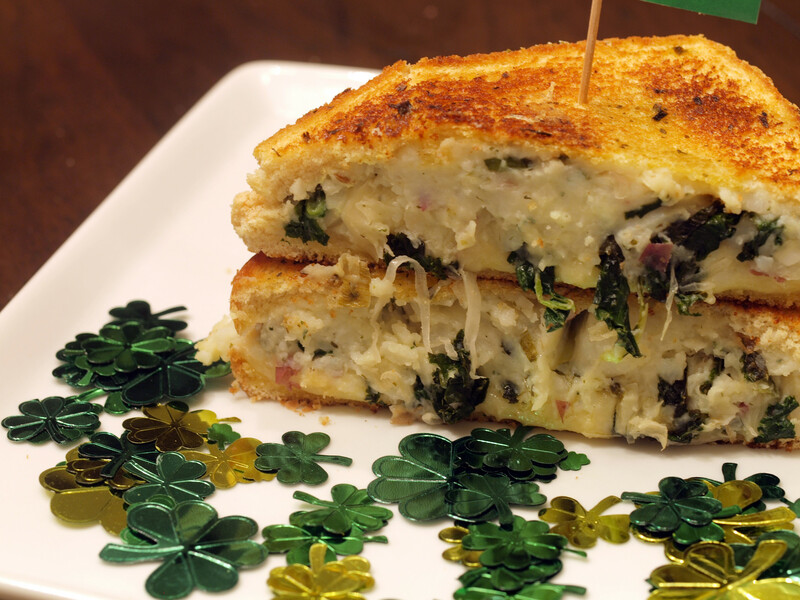 With this St. Patrick’s day grilled cheese, all of the ingredients and flavors combined to make an amazing grilled cheese and not one ingredient was unnecessary in the least. Thank you very much, Kerrygold, for the free cheese and butter as it allowed me to create a very delicious St. Patrick’s Day grilled cheese treat. 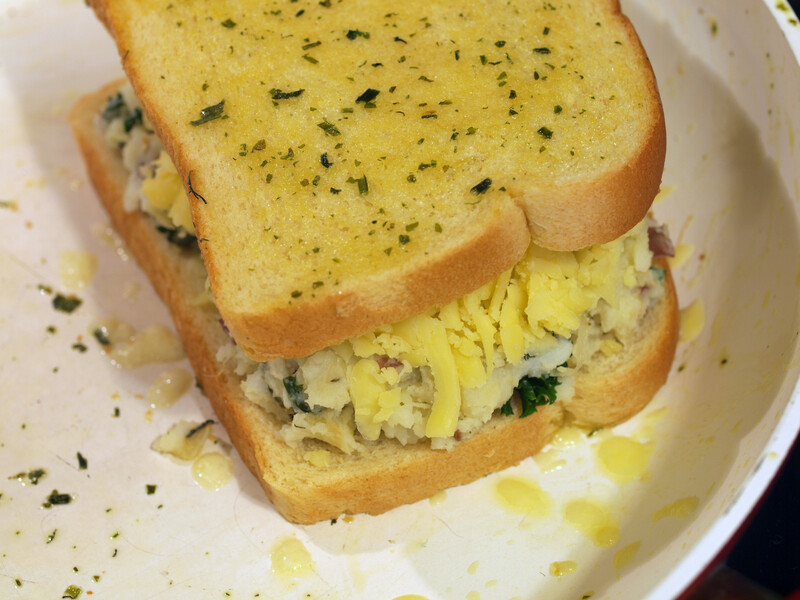 Posted in Grilled Cheese and tagged A, garlic, garlic and herb butter, green onion, grilled, kale, kerrygold, potato bread, potatoes, red potatoes, sauerkraut, Skellig, st patricks day. ← Facebook, you are dead to me.